During eddy current inspections of heat exchanger tubes, most Eddy Current Inspectors at one time or another have recommended the plugging of a tube as a precautionary measure. The indication may have been from a serious defect such as a deep pit or a benign indication such as a magnetic inclusion or a roll stop (slight thinning from the inside and outside of the same location in the tube that occurs in manufacturing). Figure 1 shows signals from a magnetic inclusion, a through wall hole, and a roll stop at a single inspection frequency[Throughout this paper, the example eddy current signals shown are from a 7/8 inch diameter x .055 wall, Copper Nickel 90/10 tubing, liftoff is adjusted horizontal]. Certainly with one frequency it is not possible to distinguish between these three signals. Today, most eddy current inspections of heat exchangers are carried out using four frequencies simultaneously, and an experienced Inspector can distinguish between pits, magnetic inclusions, and roll stops by noting how the angle changes for an indication from one frequency channel to another. In Figure 2, which shows these three indications at four frequencies, the experienced Inspector notes whether the signal rotates clockwise or counterclockwise from one frequency to another. A quick survey of Eddy Current Inspectors will reveal that no Eddy Current Inspectors make this determination on every indication, and many Inspectors never make this determination, preferring instead to recommend the plugging of a tube as a precautionary measure. It is safer to remove a good tube from service than to risk one's reputation by having an inspected tube leak soon after the inspection. There is a need for a better and easier way to distinguish between holes, magnetic inclusions, and roll stops. Magnetic Inclusion Fig 1: From Top to Bottom: Magnetic Inclusion, Hole, and Roll Stop Signal. It has been over 30 years since Hugo Libby of Battelle Northwest promoted the use of Lissajous figures for eddy current testing of tubes. With Lissajous figures, it is easy to see the angle of indication and the angle of the indication correlates quite well with defect depth. Ever since multi-frequency, eddy current instruments came into common use for inspection of tubes in the early 1980's, Lissajous figures have been used with the Lissajous for each frequency displayed at a different location on the screen so that the Operator would know which Lissajous figure represented which frequency channel. Fig 4: From Top to Bottom: Magnetic Inclusion, Hole, and Roll Stop Signals. Imagine if instead of a few frequency channels, you had virtually unlimited frequency channels, such as the 25 shown for each of the three indications in Figure 3. Then instead of showing each Lissajous figure at a different location on the screen, you superimpose them on the screen as in Figure 4. Even in this monochrome form, each of these indications has its own unique pattern. Now add color to indicate frequency as shown in Figure 5[Figure 5 and subsequent figures are in color and therefore appear at the end of the text]. In this figure red is used for the lowest frequency Lissajous and the color changes through orange, yellow, green, blue, to magenta for the Lissajous figures with the higher frequencies. Figure 5 is a frequency transform in that the additional dimension of frequency has been added to the Lissajous figures. There is now an obvious visual difference between the signals from the magnetic inclusion, hole, and roll stop. (Top, center, bottom.) Even an entry level Eddy Current Inspector could clearly see the difference. Figure 5 shows three different forms of the frequency transform for each of the three indications. These three forms of signals can be referred to (from left to right in Figure 5) as the (1) low to high frequency transform, the (2) high to low frequency transform and the (3) end point frequency transform. In the low to high frequency transform, the low frequency is first drawn to the screen, followed by the second lowest frequency, and proceeding through to the highest frequency being drawn last. In the high to low frequency transform, the drawing has occurred in the reverse order. The reason for showing both of these is that if the indication being examined was at a similar angle in all frequencies, it would be difficult to observe what was happening to the amplitude of this signal as the frequency changed if the lower amplitude were drawn first. Hence, by drawing these images in both low to high and high to low order, less information about amplitude is hidden. For these three signals, the amplitude information is fairly well visible, but this is not necessarily the case for all eddy current signals as will be discussed later. The end point frequency transform solves this problem and, therefore, the end point transform is the easiest to read, conveying the most information. Certainly the end point transform does not in any way look like the eddy current signals that most Inspectors are familiar with. For this reason, the high to low and low to high transforms have been included in this figure to help the reader understand how the end point frequency transform is derived and how it relates to the eddy current signals that existing Inspectors are familiar with. The advantage of the end point transform is that it is easy to see subtle changes in angle and amplitude as frequency changes. In order to maintain a constant appearance for the frequency transforms of the various signals, each of the frequency channels must be adjusted in a standard way. The method used here is to use liftoff, such as a signal from a dent, as the phase reference. This is adjusted horizontal in all channels. The through wall hole of an ASME Calibration Tube is used as the amplitude reference, and the gain of each frequency channel is adjusted such that the signal from the through wall hole will have the same amplitude in each of the frequency channels. Setting the liftoff signal horizontal and the hole signal to a specified amplitude happens to be consistent with the ASME Code for inspecting heat exchanger tubes. Figure 6 shows the three forms of the frequency transform for a dent. When one examines the three transforms from the dent signal, you will note that you cannot see the low frequency component of this signal in the low to high frequency transform because when the hole is set to the same amplitude for all signals, the dent is lower in amplitude in the lower frequency channels. That portion of the low to high frequency transform is overwritten by the higher frequencies; therefore, it is not visible in this transform. The high to low transform does show the low frequency information clearly, since the lower amplitude signal, the low frequency Lissajous, are written last. This is an example as to why both low to high and high to low transforms may be required; however, if you examine the end point frequency transform, all of the information is clearly visible. It is easy to see that as frequency changes from low to high, the amplitude of the signal continuously increases while the angle remains constant at zero degrees. Refer to the frequency transform for the hole that is shown in Figure 5. It is easy to see in the end point transform that the lowest angles occur at the lowest frequencies, that the angle increases to some maximum at mid range frequencies, and then rotates counterclockwise to the highest frequencies while the amplitude remains constant throughout. Figure 7 shows the three frequency transforms for each of the four O.D. pits in an ASME Calibration Tube, 80, 60, 40, and 20 per cent through wall. The 80 per cent pit signal shows increasing angle and decreasing amplitude with increasing frequency. For shallower pits, these two effects are more pronounced. 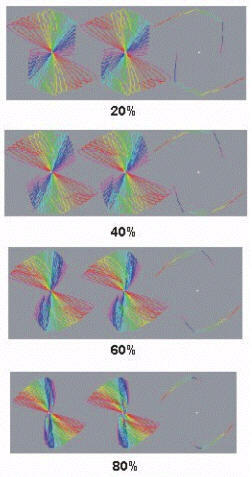 Defect depth can be measured using either the range of angles or the range of amplitudes. It is even better to independently determine defect depth using the range of angles and the range of amplitudes separately, and compare the result to establish increased confidence in the measured result. To expand on this, note that measuring the amplitude of a Lissajous figure is very unlike measuring the range of amplitudes in a frequency transform. If, for example, you measure the amplitude of a lissajous figure that does not give you the information as to whether this defect (if indeed it is a defect) is on the inside of the tube or the outside of the tube, whereas if you measure the range of amplitudes in a frequency transform, the range of amplitudes increases with frequency for inside defects and decreases with frequency for outside defects. The range of amplitudes can be correlated to defect depth. Measuring the range of amplitudes and the range of angles are two independent measures of defect depth. The results should be very similar. 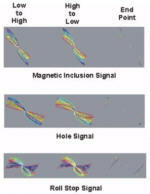 If they are significantly different, then this implies that you are not measuring the depth of a defect, but instead the anomaly you may be measuring might be a magnetic inclusion, roll stop, or other phenomenon. The Author has successfully used this technique to measure and confirm defect types and depths for over 10 years. Figure 8 shows the frequency transforms for three I.D. pits, 25, 50, and 75 per cent through the wall, all the same diameter. Each of these three signals shows a phase angle that initially increases with frequency, but then decreases at the higher frequencies. Amplitude constantly increases with frequency. It is interesting to note that the reversal in phase angle change occurs at the frequencies represented by the bright blue in the 75 per cent pit, but at the lower frequencies represented by green in the 25 per cent pit. Additional work needs to be carried out to study these subtle changes to determine if this information can be used for more accurate sizing of I.D. pits. 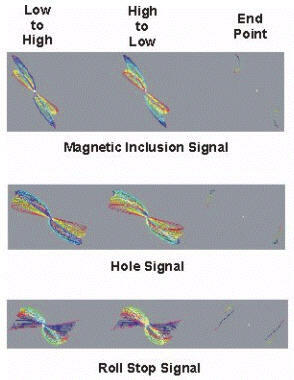 Each different signal source has its own unique color pattern in the frequency transforms. To summarize what we have observed so far: A dent or liftoff signal creates a straight line increasing in amplitude with increasing frequency. A through wall hole signal maintains a constant amplitude while first rotating clockwise with increasing frequency and then rotating counterclockwise. An O.D. defect has continuing decrease in amplitude as frequency increases and continually increasing angle. An I.D. defect signal has increasing amplitude with increasing frequency and an angle that initially rotates clockwise and then counterclockwise. Certainly none of this is a great surprise to an experienced Eddy Current Inspector. Frequency transforms apply equally well to absolute eddy current signals as they do to differential eddy current signals. Frequency transforms can be used on strip chart representations of eddy current signals. It is not necessary to have available the full length of a defect signal in order to analyze it. With a frequency transform, information about the defect type and depth can be ascertained from one sample point and the origin or from any two sample points. Even the tip of the Lissajous figure in which the trajectory of the Lissajous figure is perpendicular to the central portion of the Lissajous figure with the maximum rate of change, information about the defect type and depth is contained in the angle and amplitude changes between one frequency channel and another. This may make it possible to independently measure separately two defects that occupy an overlapping position in a tube. The displaying of complex data utilizing color-coded signals is not restricted to eddy current signals, but will prove of use in any application where there are multiple time variant signals. (The signals need not vary in time, but could vary over another parameter, such as distance.) In any situation in which information can be obtained by comparing one signal to another, transforms such as these will be of use. In addition to being useful to eddy current testing, transforms such as these may be useful in other fields, such as Non-Destructive Ultrasound testing and Acoustic Emission testing, multiple trace EKG display, displays for seismology, sonar, and in many other applications. The color figures presented in this report have been decreased in size from their original computer screen images in order to fit them all on one page. Further, the printing process has resulted in loss of color fidelity and sharpness. The original full size color figures may be viewed in their original color fidelity and sharpness on the World Wide Web. Go to the eddy-current web site, click on the ect Machine, and then click on the title of this report. This new frequency transform technology will soon be available commercially in Eddy Current Technology Incorporated's new product, the ect Machine, which will be released in the near future.